Below are the issue highlights and Editor Picks for the January issue of JDD! Final Data From the Condition of Submental Fullness and Treatment Outcomes Registry (CONTOUR) provides insights into the treatment of submental fat in clinical practice. Tretinoin 0.05% lotion provides an alternative solution in Novel Tretinoin 0.05% Lotion for the Once-Daily Treatment of Moderate-to-Severe Acne Vulgaris in a Hispanic Population. Efficacy and safety are maintained with physician satisfaction in Open-Label, Post-Marketing Study to Evaluate the Performance and Safety of Calcium Hydroxylapatite With Integral Lidocaine to Correct Facial Volume Loss. A majority of subjects had lasting results and perceived younger than baseline in Open Label Study Evaluating the Efficacy, Safety, and Effects on the Perception of Age After Injectable 20 mg/mL Hyaluronic Acid Gel for Volumization of Facial Temples. Authors review and assess available trials in Oral Collagen Supplementation: A Systematic Review of Dermatological Applications. Patient Satisfaction Following Treatment with Microfocused Ultrasound With Visualization: Results of a Retrospective Cross-Sectional Survey conducted to help optimize treatment outcomes. Increased recommendation and admin may lead to higher usage and less morbidity in Update in Herpes Zoster Prevention and the Role of Dermatologists. A Cohort Using a Ceramides Containing Cleanser and Cream With Salicylic Acid for Dry, Flaking, and Scaling Skin Conditions evaluated an effective, safe, and easy solution. Managing the Aesthetic Patient should consider aging process, assessment, and anatomy to identify safest and best techniques. Seborrheic Dermatitis in Skin of Color: Clinical Considerations highlights various practical considerations that impact treatment choice. A Novel Approach to Enhancing the Appearance of Moisturization in Photoaged Skin safely and effectively improved the smoothness and softness. Protein load over time can increase risk of diminished efficacy in Incobotulinumtoxin A: A Highly Purified and Precisely Manufactured Botulinum Neurotoxin Type A. From Babies to Boomers: Understanding Nuances for Stratum Corneum Care(Unilever). 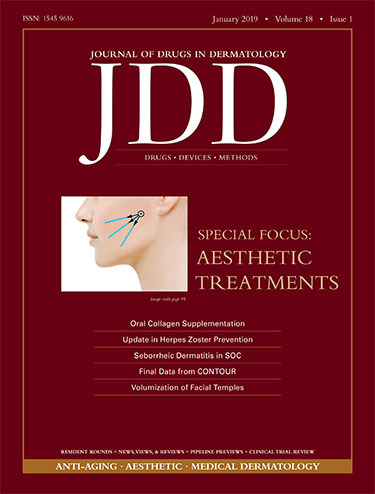 For past issue highlights visit the JDD Corner on Next Steps in Derm!